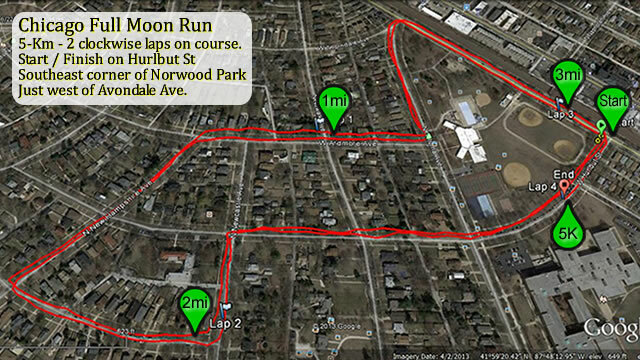 6th Annual 5-Km and 1-Mile Road Race Under the Full Moon! Race week is upon us and we're looking forward to seeing all Full Moon runners this Wednesday evening, here on the roads of Norwood Park! Online registration will be open until Wednesday August 9th at noon, 12:00 pm CDT. We'll have limited onsite race-day registration at runner check-in, near our race start / finish area, from 6:00 pm -to- 7:15 pm... cash or check only: $30 for 5-Km, $25 for 1-Mile... no guarantee on shirt availability. Race day at noon... a race-day email alert message will be sent to all registered participants. This alert will include race-day details, rules of competition, and last-minute instructions. Please keep an eye open for arrival of your email alert. All packet pickup will take place onsite at our start/finish area, beginning at 6:00 pm CDT. 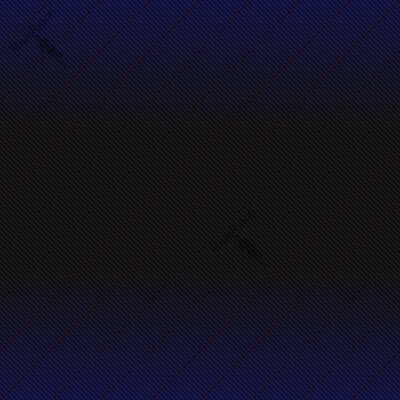 Welcome to our unique road race and charity fundraiser, with all proceeds to benefit the battle against Multiple Sclerosis. It's our 6th year, and once again we'll be taking to the streets of Norwood Park, basking in the glow of a Chicago Full Moon! Yep... we'll be racing in the streets under the full moon out among the cicadas, crickets, and other creatures of the night. How fast can you run under this year's Full Sturgeon Moon? Immediately following the race... please join us at Mo Dailey's Pub & Grille (located across the RR tracks, 6070 N. Northwest Highway) for refreshments and Full Moon Run awards! Our racecourse has been described as "fast," and "the most neighborhood-friendly in the city." Race time is just before sunset and the entire course will be illuminated by ambient light and impending full moon. Feel free to bring a head lamp, although you won't necessarily need one. Our Chicago Full Moon 5-Km featured event will present awards, three-deep, custom trophies to Top Overall performances! Masters: defined as runners of age 40 and above. In addition, our Chicago Full Moon 5-Km featured event will present awards, three-deep, gold, silver, and bronze medals to fastest Age Group finishers! Pre-registration is online only. Click the "Registration" tab above to submit your registration. We encourage you to save money and register early. Race day registration is available from 6:15 pm - 7:15 pm (cash or check only: $30 for 5-Km, $25 for 1-Mile... no guarantee on shirt availability). 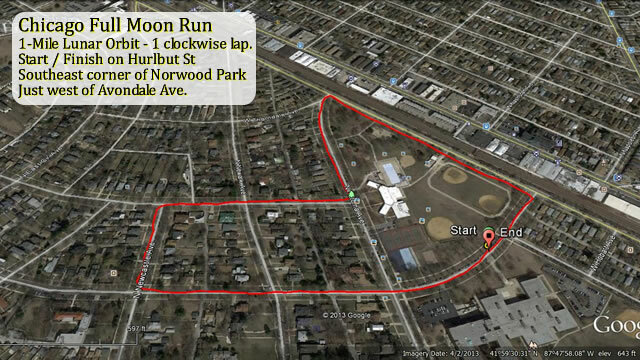 Participant check in, and packet pick up will take place from 6:15 pm to 7:15 pm at our race start / finish location near the intersection of Avondale Avenue and Hurlbut Street, at the southeast corner of Norwood Park. Parking is available along Avondale Avenue (see maps below). "A" marks the location of our Start / Finish. "B" marks the 1 mile mark, lap one. "C" marks the 2 mile mark, lap two. "D" marks the 3 mile mark, lap two. "E" marks the 5 kilometer mark, finish line. Note: Mileage markers on the Google map are approximate. If you have the Google Earth plugin installed, you may click the "3D>" button (left-side of split screen) and experience a flyover tour of our course as it tours the picturesque roads of Norwood Park. Our Chicago Full Moon Run is a USA Track & Field sanctioned event. You may visit the USATF website by clicking either logo image.